Home Vitiligo How Is Vitiligo Laser Resurfacing Performed? Vitiligo is a condition in which the skin develops white patches on certain areas such as the face, mouth, lips, hands, legs, and arms. This condition is caused by the death of the pigment melanin. Melanin is what is responsible for producing the color of the skin, and if this pigment is dysfunctional, it will lead to the problem of vitiligo. This may also start to spread to the entire body such that the entire body will almost be covered by white patches. This condition is common in people who have dark skin. Depigmentation may also occur in adults who have undergone aggressive laser procedures on the face, and those who have had traumatic accidents or other surgical procedures that result in scarring. In order to cure the problem of vitiligo, many people look into the benefits of laser therapy which is now often recommended by medical practitioners for its effectivity and remarkable results in vitiligo treatment. This is one of the safest treatment methods available today, and does not take a lot of time to undergo. Significant changes in the color of the skin become visible within very short periods. This procedure involves a special optic fiber and the use of excimer laser. The patient who is about to undergo this treatment will be asked to lie down, after which the light from the laser device will be focused on the areas which are affected. The light will be of a particular intensity initially, and that intensity should be used until the entire process is done. Any overexposure of focused light may result in damage, such as burning sensations and irritation. 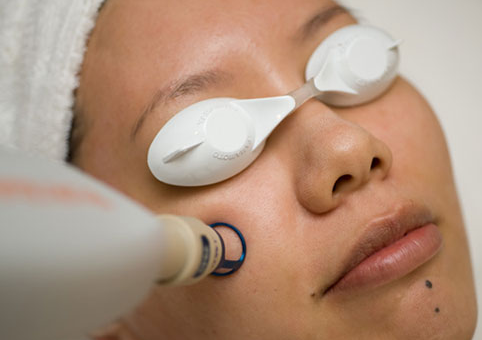 Definite changes will be noticed as laser therapy works by stimulating the melanocytes in the skin. These melanocytes are the cells which produce melanin, the pigment responsible for producing color in skin. When these melanocytes are stimulated, they will start producing melanin which will then result in skin repigmentation. Excimer lasers work by emitting narrow-band UVB light to stimulate repigmentation on affected areas. The advantage of laser therapy is that the laser penetrates deep into the skin, reaching the surviving pigment-producing cells and stimulating them to renew the production of pigments in the vitiliginous areas. There will likewise be more distinct effects if laser therapy is done in combination with tacrolimus ointment. This combination will give a faster result in countering the vitiligo effect on the skin. The only disadvantage of laser treatment is that it is very expensive and it is thus only undertaken by people who can afford it. No other disadvantage has been reported and this is a generally safe and painless method for treating vitiligo. The patient goes through a series of sessions, and touch-up sessions may be needed occasionally. A recent study has found that in vitiligo patients who did not meet success with other conventional therapies and who were treated with excimer laser therapy thrice a week, a remarkable 57% of the white patches had partial to complete repigmentation in just 14 days.